Why are C-section births increasing in India? It is a fact that nothing beats the pain a mother goes through when she is in labour. Yet, surprisingly, it is also true that the first priority of most women is to hope for a normal vaginal delivery if all goes well. However, the possibility of a c-section always looms close by. Women often find themselves juggling thoughts of a normal delivery as against a caesarian. The uncertainty and inexperience only add to the fear and stress of birthing that a new mom is already facing. In this article we will find out the reason of the rise in C-section births in India. Have you ever wondered why we see more babies born via a caesarian these days as compared to the times of our grannies and even moms? Recent statistics have shown an alarming increase in the number of Caesarean deliveries in India. 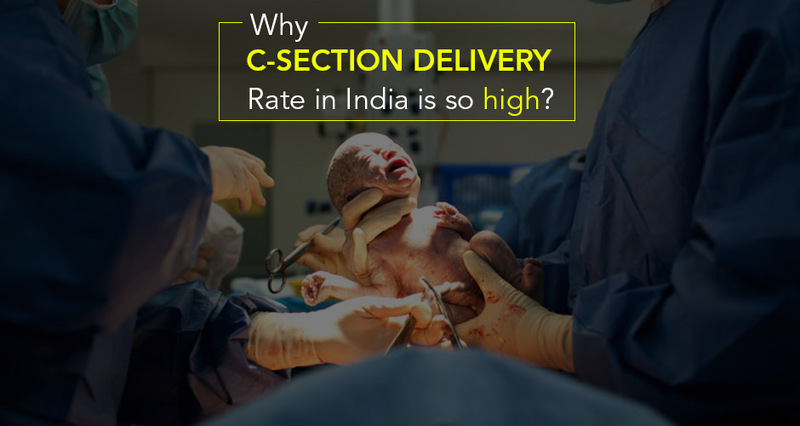 While the World Health Organization caps the percentage of Cesarean delivery per area at about 10-15%, India has long passed this threshold. In fact, figures from many private hospitals, across various districts of India, indicate that over 50% of the deliveries are not natural. More women are opting for controlled birthing methods. The healthcare sector is profit oriented, pushing them for these alternative birthing methods. The numbers of Caesarean deliveries are three times higher in private hospitals in comparison to public hospitals. Almost 45 percent of Urban Indians who visit a private hospital have a caesarean surgery. Of course, when used correctly, Caesarean procedure can save the life of the mother and the child. However, when the rate increases above 15%, the WHO suggests that the number of deaths related to childbirth actually increase. There are several other reasons why the sudden increase in the number of Caesarean childbirths is a cause for concern. As mentioned before, the mortality rate of infants and the risk to the mother’s health increase when a nation crosses the recommended rate of surgical births. There are several other ill effects as well. One of the biggest concerns is that children who are born through Caesareans are likely to develop allergies, type-1 diabetes, and issues like obesity. In fact, studies in Scotland that extended over 15 years revealed that children are likely to have more health problems in case of planned Caesareans in comparison to the ones that are performed in case of an emergency. This is also a subject of interest in terms of finances. India is heading towards the path that Western countries have chosen. A study conducted by the WHO showed that some countries spend close to $2.3 billion each year on unwanted Caesareans. This trend will soon become evident in India. Why is there such a sudden rise in Caesarean Deliveries? In Indian the Medical Model of Maternity Care is chosen over the Midwifery Model. This means that the focus is on detection, diagnosis, prevention, and treatment of any possible complication. The Midwifery method on the other hand, considers this a natural process that focuses on the experience of childbirth. Therefore, the chances of intervention and suggestion of Caesarean births are much higher today. The vision created by the media of childbirth is one of extreme pain and horror. While you would expect that women who have access to more information and better facilities such as a clean and safe birthing area, better nutrition and medical assistance would be more confident, it turns out that they are extremely fearful of the process. As a result, they tend to opt for controlled birth methods in order to ease the process of labour. Caesarean surgeries come with their set of risks that even have several health disadvantages to the child in the end, as discussed before. However, most mothers-to-be believe that this is the safer option in comparison to normal vaginal birth. Caesarean surgeries must only be chosen when necessary as it changes the body of the mother quite significantly, too. The short-term risks include infections, blood clots, pain, and even a stroke. The long term risks include complications due to severe hormonal changes, infertility, disrupted bowel movements and prolonged pelvic pain. In the private healthcare sector, Caesareans are very accepted and almost normal. Although the procedures are a lot safer today, this major surgery can have life-altering repercussions. Caesarean surgeries can take as little as 20 minutes to complete. This is more convenient in comparison to normal birth that can last for hours on end. Sadly, in many sectors of medicine, it is also seen as a method for doctors to earn incentives. This “patient” load system can lead to unnecessary recommendations of this surgery. Taking the caesarian route is definitely emerging to be a convenient way out, both for earning more money and enhancing business output as well as flaunting the number of surgeries under one’s belt. If you are about to give birth, educate yourself about the risks and the facts about C-section births in India or in general. Make sure that you only opt for it if necessary. If not, a natural birth is more fulfilling and is a lot safer for the mother and the child.